Completed – completed tasks. Very important because comments and attachments may include the requested info. Ideas have a white background, overdue tasks are red, future tasks are green and completed tasks are blue. Under each task you can see the due date, the owner, any projects / departments the tasks belongs to and tags associated with the task. If the task was created during a meeting, there is also a link to the meeting title to quickly find the context of the task. When you click on one of the tags or the name of the task owner, it will be added to the filter at the top of the page. This way you can quickly find all related tasks. This filter remains when you switch from meetings to tasks and to the calendar view. *You can also create new tasks on this Tasks page. When you click the “Add Task” button, the new task will automatically be part of the project / department and get the tags that you have in the “Projects / Departments / Tags” filter at the top of the page. 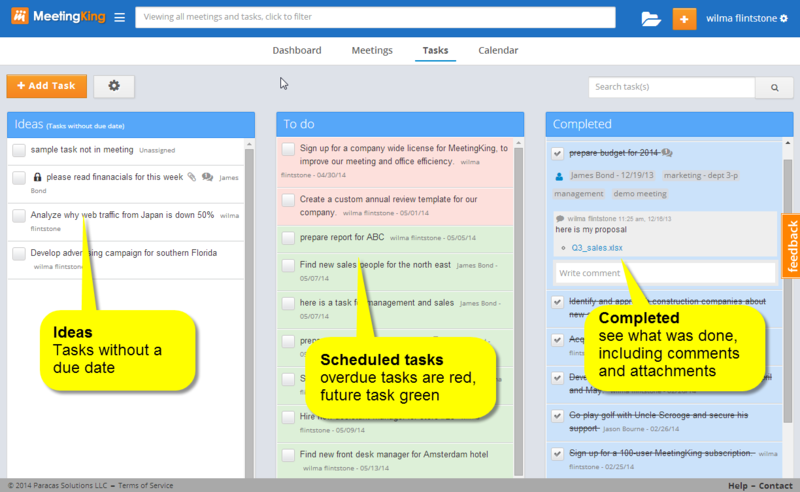 This makes MeetingKing the easiest project management tool you have ever used.